Recently, Joel Rose of New Classrooms posted a thought-provoking piece about some of the challenges he sees with the blended learning models that are not his own. I have heard the arguments before, but I have to disagree. We have seen the rotational model succeed again and again, and there are some very good reasons why it does. In his article, Rose writes that in a rotational model, there is a synchronization challenge--that students move from online instruction to small group instruction, and the teacher does not align lesson plans with digital content. While Rose sees the role of technology as presenting the same material a different way, we at Education Elements believe that the role of technology is to meet students where they are and bring them forward or advance them. The premise of personalized learning is that students are working through content at their own pace and on their own path, and that the role of the teacher shifts from "sage on the stage" to "guide on the side". Alignment is inherently a misguided goal as it would assume students are on the same path. Teachers deepen learning--not by having a teacher-centered lesson aligned to a digital content lesson, but by deepening students’ understanding through application of learning and by creating ways for students to show what they know. The key in quality station rotation programs is building student metacognition through goal-setting, as well as teachers engaging with students around their goals and encouraging deeper learning in small groups. Although all teachers in all classrooms may not be able to master this new approach completely, more and more are getting close and every step along the path is better than what they were doing previously in a traditional classroom where they were forced to teach to the middle. With blended learning, we encourage teachers to spend more of their time on the higher order levels of thinking in Bloom's Taxonomy. It may be, for instance, that students are practicing and gaining fluency on math facts or grammar skills, while they are applying their knowledge in a project or essay while working with their teacher. The technology can and should play a different role than that of the teacher. Complementary parts can create a more robust whole. We have found that the rotational model works. For those who have been in the game for a while, it may seem old or stale. But for most schools and districts? Introducing adaptive curriculum and using data from the digital content providers to help drive instruction in small groups is a radically new way to approach data rich teaching and learning --one that has seen success in K-12. Station rotation works well within the constraints of existing school buildings. 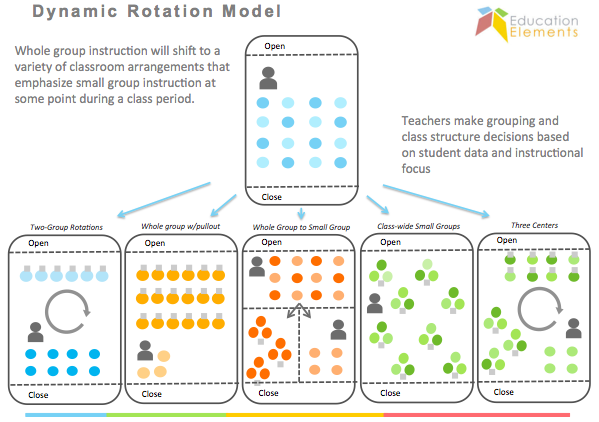 You don’t need different sizes and shapes of classrooms to implement a rotational model. You can do it in classrooms today. It is understandable to teachers. Station-based learning is not a foreign concept, and is a great way to dip your toes in the water and explore the benefits of better differentiation through digital content. It's also a change that is feasible to implement at any point of the year because it doesn't have space requirements. With the right support and tools, a rotational model works for any teacher. It enables teachers to use data to change how they are teaching and in a way that is sustainable. It allows teachers to make decisions about what groups students should be in based on where they are in mastering a given concept, and it lets them re-group constantly, and differentiate all the time. A rotational model can also work in any subject. In fact, multi-subject implementation can build habits and cultures for both students and for teachers, vs. a single-subject implementation. Teachers can collaborate, administrators and leaders can provide coaching and support. If blended learning is happening in most or all classrooms in a given school, it becomes a new way of teaching and learning across the board, rather than an isolated event. At Education Elements, we have partnered with over 100 schools across the country ranging from charters like Rocketship and KIPP LA to big public school systems like DC Public Schools, Middletown, Newark and Horry County Schools. When these schools were provided the option of various models to chose from in 2013, they chose the rotational model. And now, they have evidence of extraordinary academic results in just one year. Just take a look at the results from Landmark Academy in Colorado here. The need to explore and test innovative school models is essential. We know this--we have helped fifteen Next Generation Challenge winners design award-winning breakthrough models. And as these models are being tested and iterated upon, we don’t have time to wait. So, we will keep helping schools do what we know works, at the same time that we help others test new ideas. Our goal is that students achieve, today and tomorrow, with whatever model--rotational or not--is most appropriate for the school based on the problems they are trying to solve. Anthony is the author of "Personalized Learning Playbook, Why the Time is Now", and his new book, "The NEW School Rules: 6 Vital Practices for Thriving and Responsive Schools". He has contributed to many other publications on new school models including Lessons Learned from Blended Programs: Experiences and Recommendations from the Field. 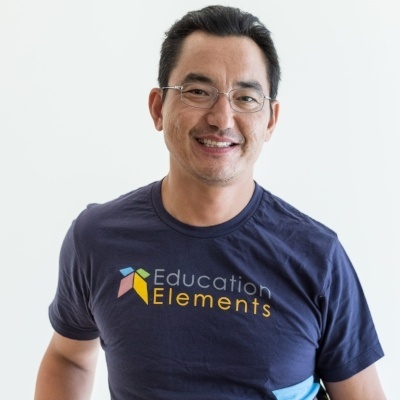 Anthony is a nationally recognized speaker on personalized learning and his work has been referenced by the Christensen Institute, iNACOL, EdSurge, CompetencyWorks, and numerous other research reports. His work includes partnering with districts across the country who are implementing personalized and blended learning through Education Elements. Beyond implementing personalized learning models, Anthony focuses his research on organizational design and culture of innovation at school districts. Though this research, he is currently working on a new book, called Responsive Ed, which bring self-organization strategies to districts so that they can be more responsive to the changing needs of the community. Anthony is a graduate of Cornell University and lives in San Francisco.